*And, to encourage you to pray and not give up when God puts a desire in your heart. October 29, 2011, Joel Kent reluctantly pushed his way into the world at Bozeman Deaconess Hospital in Montana, making me one of the happiest moms ever. 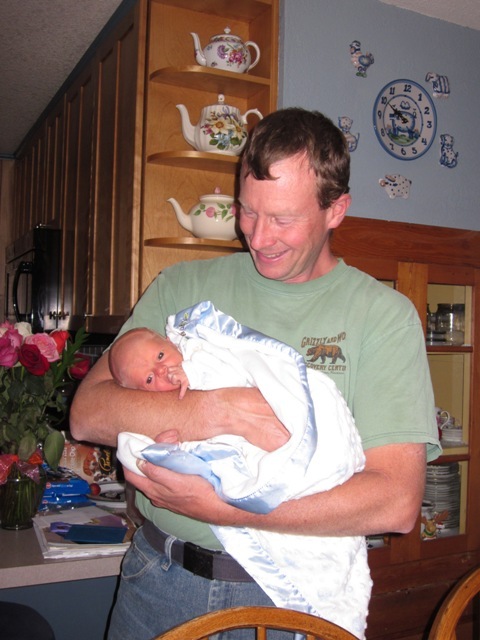 It has been almost 12 years since the last time I had such a joy, holding a miracle shaped by the hands of God. For some moms, babies come easily, but for others the road is one of tears and prayers. I came from a family of five children, so I expected my family would be similar. God sent us our first two children with only a few months of prayer. After our August wedding, my husband Kent and I prayed for a baby. By Christmas we knew we were expecting. The following August (1990) our beautiful daughter Kallie Grace was born. Our doctor discovered Kallie had a heart murmur. It was a test of my faith when Kallie had heart surgery at eight months old. Just before Kallie turned two, I stopped nursing her and we prayed for another baby. It was only a month and God had a little boy on the way for us. Our Jacob Lee was born in June of the following year (1993) with a small hole in his neck. It was a sinus tube that drained like a runny nose. At the age of two, Jacob had surgery to close the hole, another test of my faith. And I wondered if I was capable of having a healthy baby. 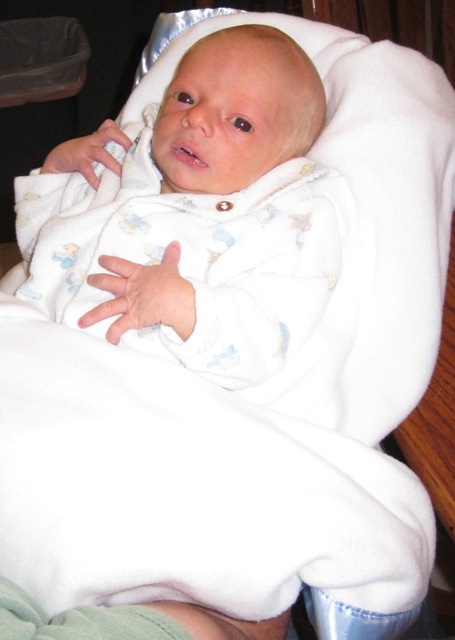 When Jacob was just a few hours old, I was lying in the hospital bed holding him in my arms. God put the desire in my heart for more children. Little did I know this desire would become one of the hardest prayers of perseverance in my life. When Jacob was half a year old, I started reading a One Year Bible, a goal I’d had for many years. I continue these daily Bible readings today. That same year I was introduced to prayer journaling by author Becky Tirabassi. Along with my Bible reading, I started jotting down my prayers (later this became My TEA CUPP Prayers). One of my main prayers was for friends having babies. At the time we barely had enough money for groceries, so I couldn’t send my friends baby gifts. Instead I sent them a poem and promise of prayer. When I learned about friends who were trying to conceive, I added them to my prayer list. Over the years, I lifted dozens of couples and babies to Jesus in prayer. At one point I decided to add my name to my baby prayer list, hoping God would bless our family again. But God needed to put the desire in my husband’s heart, too, and I had some chronic health issues to correct. When Jacob was six, I was reading my One Year Bible when a verse from 2 Kings 4:16 popped out at me that I had never noticed before. “Next year at this time you will hold in your arms a son.” I claimed this promise and a month later we were expecting! When Kallie was almost ten and Jacob was almost seven, Kevin Jon came into the world (2000). I was so happy that God had filled this desire of my heart after seven long years of prayer. I never thought God would make me wait longer than seven years to answer another prayer. Kevin is worth every bit of prayer and perseverance. He has no health problems, except a tendency to dislocate his elbows. He was a quiet baby until he discovered being louder than his brother got attention. Soon Kevin was the one dominating the dinner conversations, and I wondered what God’s calling would be on his voice. As Kevin grew out of his baby clothes and car seats, I asked Kent what he’d like me to do with these items. Kent shrugged and said, “Give them away.” I was disappointed that he didn’t want to make use of them again. The years went by and I kept praying, slowly giving away our baby things. Every day Kent took Kevin for an hour in the afternoon to “help Daddy.” They did a project together at the church camp where we lived. As I watched Kent work with Kevin and his big brother Jacob, I couldn’t shake what a good Daddy he is, and thought he should be a Daddy again. One day a lady was chatting with me in the dining hall at camp. She mentioned how God doesn’t just have a little basket with one blessing for each person. He has an overflowing basket of blessings for each of His children. “What do you mean?” I replied, already knowing my answer. “Well, I’ve always wanted to try fly fishing, so I might like a fly-fishing pole.” Kent explained. Kent took my answer to heart, and from that day forward he joined me in prayer for another baby (poor Kent still doesn’t have a fly-fishing pole). When Kevin was nine years old we discovered we were expecting. I rejoiced that God had answered our prayers after all these years! But instead, God was allowing me to go through a time of deep sorrow and grief. We lost this baby in a miscarriage at three months, nearly losing me as I bled too much (July 2009). We named our baby Gloria Anne in hopes that God’s name would be glorified in our sorrow. With the help of friends, we started a childcare building at camp in her memory called Gloria Anne’s Place. Just a month after losing Gloria Anne, I became pregnant again. This time I thought God had answered my prayers for sure. But our faith was further tested as I endured another grueling miscarriage that took over six weeks to complete (November 2009). We named this little one Angelica May because she was with the angels and due in May. She was just two months along. They say that a mom’s body is ripe to conceive for the first six months after a miscarriage. When six more months went by with no babies, I wondered what God had planned. Then, before I knew it, I was pregnant again and lost the baby while traveling. This little one was only eight weeks along. We named her Gabriella Hope, still hoping God had a baby planned for us (June 2010). Because of these three miscarriages, more people were praying for us. In the meantime, I was getting older. I kept reminding God that time was running out. Did He remember my biological clock? My doctor told me a person my age has a miscarriage rate of 75 to 80%. That was not very encouraging. But as we can see with Sarah in the Old Testament and Elizabeth in the New Testament, God doesn’t worry about biological clocks. In the fall of 2010 I heard a program on celiac disease given by our camp food service company. As I listened, I noticed many of the symptoms were mine. Twice during the program they mentioned miscarriages. A person with celiac can’t absorb enough nutrients for herself, so her body can’t absorb enough for a baby, unless she eats a gluten-free diet. I was ready to try anything, so I gave up my favorite whole-wheat and all food with gluten. On January 30, 2011, Kent, our two sons Jacob and Kevin, and I gave our lives officially to Jesus in baptism. We had all been Christians for a long time, but hadn’t yet publicly proclaimed our faith and followed Jesus’ example of believers’ baptism. It was a special day. Little did we know that exactly nine months later, God would finally bless us with a healthy baby boy, our new blessing, Joel Kent. Now I am 45 years old, with seven children ages 21, 18, 11, and 0, and three angel babies in heaven. I love all my kids. When Kallie was in kindergarten, God called us to homeschool. We’ve been homeschooling our children ever since then, planting God’s Word in their hearts. Today our independent Kallie is about to graduate college, our athletic musician Jacob will soon graduate high school, and our inquisitive Kevin is in 6th grade. And now we begin the adventure again with baby Joel. Joel’s name means “the Lord is God” and “God’s messenger.” The theme of the book of Joel in the Bible is the Day of the Lord. We proclaim through our sweet baby miracle that the Lord is God. Jesus is coming again. I encourage you to give to Him your life and the desires of your heart. Our church family has blessed us because of this little one. All those prayers and baby items we gave away have come back to us in the prayers and gifts of dear friends. We are so thankful for how God has answered our prayers and provided for us. To God be the glory great things He hath done! Thank you, Jesus, for all our children. Thank you for this new blessing of baby Joel. Please help us raise him to love you, Jesus. Amen. This entry was posted in My Tea Cupp for Moms and tagged Becky Tirabassi, christian prayer, devotions for moms, devotions for mothers, encouragement for women, miscarriage, moms, My Tea Cupp Prayers, Tea Cup Prayers by Jennifer Grace. Bookmark the permalink. Beautiful, beautiful, beautiful boy! We love and miss you all! The boys are fascinated with the pictures of baby Joel! Thank you for opening up your heart and lives to us, Jenny. Your family has been a blessing to me! So happy for you and your family! This is fabulous- and now we know the “rest of the story” and what a powerful story it is!! Thanks so much for sharing! Jenny great letter and great pictures. What a testimony for God”s goodness and answer to prayer and your waiting on him. Only God can give faith like that and such a beautiful baby!!!!!!! Will stop and see this little miracle. To my dear friends, Thank you for reading our story and sharing your hearts with me! Praise God from whom all blessings flow! Congratulations Jenny and family!! I am so happy to learn of Joel’s safe arrival, he will be such a blessing to all. I look forward to meeting this little bundle of joy… and I loved your story….